Those statements are just a few of the many received from individuals who’ve reached out and expressed their interest in getting more involved with Cop Block. Perhaps you are now wondering the same. This page exists to serve as a guide to help you connect and/or network with other CopBlockers. 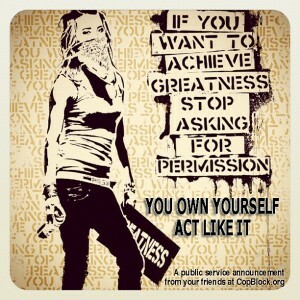 First, visit the CopBlock Network page and see if your skills can compliment others of the network. If so, sign up and become active with that growing network, which was created in early 2015 by CopBlock.org co-founder Ademo Freeman, of active CopBlockers. Second, if you’ve been wronged by, want to share a tactic or story about police. 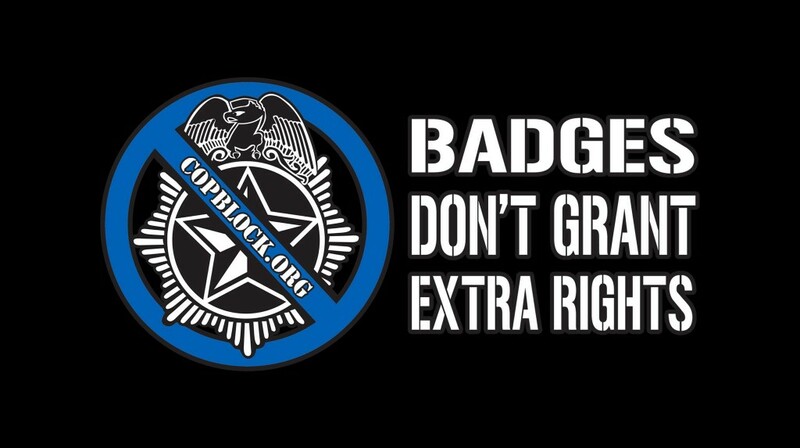 Please use the CopBlock.org submission tab and follow the instructions there. If you agree that, “Badges Don’t Grant Extra Rights” you too can get involved in whatever capacity is of most interest to you. Use or modify any content, flyers or graphics found on the site – you don’t need to ask permission. business, help to improve the production value and diversity of content. Create as you feel inspired and feed the need! Just a handful of the many unsolicited creations include a 23-second motion graphic we’ve used as a video intro, a kit of organic health care products, embroidered beanies, wallpapers, etc. If you need ideas let us know. And last but certainly not least, invest in yourself. While it’s important to get the word out, the only thing you are fully in control of is yourself. See http://CopBlock.org/Library for some thought-provoking resources. Disclaimer of sorts: Just as it’s impossible for a coercive monopoly of self-proclaimed rulers to codify right and wrong, we don’t have the hubris to believe this page exhaustive. Take what you find valuable from this site and learn from others active. Think for yourself and act according to your principles – our efforts will be mutually reinforcing. Together we’re creating a better reality.